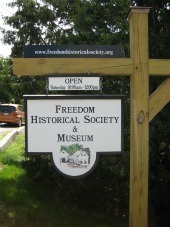 The Freedom Historical Society is working hard to provide you with interesting stories about Freedom’s past. Below are some of those featured in our quarterly newsletter. Check this page often for the latest additions! Oral Histories: Transcripts of recordings by local Freedomites.